Since its founding in 1999, UNH’s Center for Coastal and Ocean Mapping (CCOM), along with the complementary Joint Hydrographic Center (a NOAA partner), has established itself as the world leader in mapping the bottom of the ocean. Indeed, in just this past year CCOM researchers found a 1,100-meter seamount on the floor of the Pacific and were called on to help with the mysterious loss of Air Malaysia Flight MH370. But recently, the center’s work has gone far above the seafloor. It’s probed the water column to analyze gas bubbles for clues about hydrocarbon resources and climate change. It’s gone out to Massachusetts Bay shipping lanes, where CCOM technology is steering ships away from endangered North Atlantic right whales. At the New Jersey shore, CCOM researchers are looking at the damage wrought by Superstorm Sandy. CCOM’s expertise has even extended to Hollywood, which gave one of the center’s seafloor images a role in the recent “Godzilla” film. CCOM director Larry Mayer calls this wide range of research a “value-added” approach to the center’s original mandate — to improve ship navigation safety by mapping the seafloor and making the massive data collected quickly available for chart production. “Over the years, we have made great progress in attaining this goal, so we’ve also turned our attention to the opportunities provided by this huge flow of information for marine habitat assessments, gas seep detection, fisheries management, disaster mitigation and national security,” he says. A mission to the East Siberian Arctic in August 2014 exemplifies how the CCOM team has pressed existing tools into innovative service. There, a CCOM team used the same multibeam sonar that maps the seafloor to find and analyze bubbles of methane in the water column, a conceptual pillar of water that extends from the seafloor to the surface. On a Swedish icebreaker in the Arctic, Mayer and graduate student Kevin Jerram used techniques developed by CCOM assistant professor Tom Weber (a recent NSF CAREER awardee) to map and measure gas seeps of methane. Their work will inform a better understanding of methane’s impact on ocean chemistry and, as a powerful greenhouse gas, on climate change. Closer to home, NOAA tapped CCOM to support post-Superstorm Sandy relief activities, awarding a significant grant for work that aims to better understand the impact of such an event on the seafloor and on marine debris. Led by research associate professor Brian Calder, the research employs multibeam sonar as well as LIDAR (airborne laser bathymetry) and could prepare coastal communities to weather future storms. "This work is aimed at pushing the research so we have the appropriate tools for quick response after the next super storm — and there will be more—and helping us understand where we will be vulnerable and where we won't," says Mayer. Making sense of all this data is CCOM’s Data Visualization Research Lab, headed by professor Colin Ware. From high-resolution nautical charts and marine debris tossed up by Sandy to the feeding behaviors of whales and ecosystems interactions of fisheries, Ware and his team bring research to life with visually stunning, interactive tools that serve up data so it can be easily understood and used by decision-makers. Even as CCOM research spans the globe, scholars from across the nation and around the world come to Durham to learn the latest in hydrography. Part of UNH’s School of Marine Science and Ocean Engineering, CCOM offers master’s and doctoral degrees as well as focused training for professionals working in the field. Through the GEBCO (General Bathymetric Chart of the Oceans) partnership with the Nippon Foundation, each year six international fellows, primarily from developing countries, earn certificates in ocean mapping at CCOM. 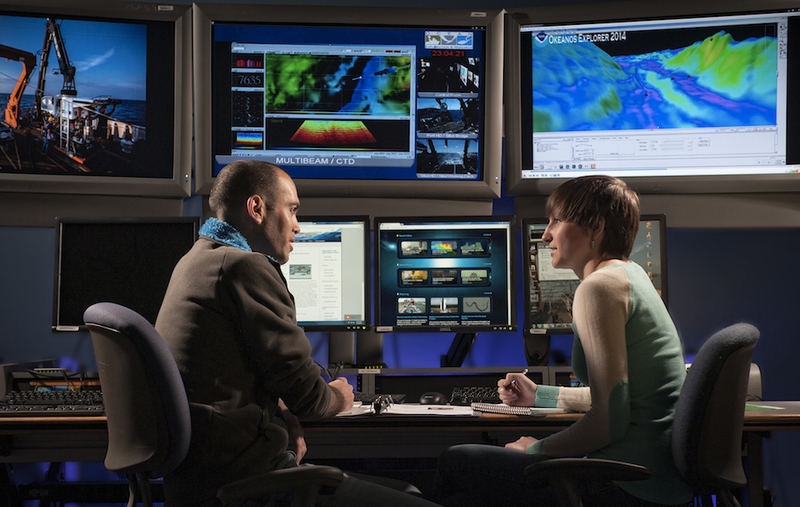 Mayer credits innovation from all corners of the center’s home in Chase Ocean Engineering Laboratory with boosting CCOM’s reputation as a leader in hydrography. "The key to our success is a group of very talented people from very disparate fields who focus their energies on a very important topic, ocean mapping," he says. Read more about UNH research activities in the 2015 research review SPARK.